If you are seeking for an easy method to recover your data files from backup file, then you are not alone. Considering the popularity and wide usage of Windows XP many users might have used NTBackup utility and have backup files for security of their data files. This application of creating backup was free and inbuilt and thus was used by many for backup creation but there was no provision to repair BKF file if any corruption occurs in it. And these backup files are just like any other file and don't have any virus proof shell and thus it gets corrupted sometimes. To tackle this frequently occurred problem we have built a onetime solution well known as Windows backup repair tool which very intelligently extracts data files from backup file and lets you save these data files at your preferred location. BKF File Showing Errors? – It is Corrupt! Then consider that your file has been corrupted and that is why NTBackup application is unable to recognize its structure. These types of errors are signs that your backup file is completely corrupted and it is impossible to extract, recover or repair Windows backup data at your own using NTBackup application. In that situation you will have to take some external professional help which can efficiently extract data from backup file and our tool is a trustworthy solution for such need. This corruption can occur due to virus attack, sudden system shutdown, missing catalog files, etc. But our software has technical algorithms which can easily trace down the corruption issue and fix corrupt backup there by letting you extract crucial data files from it. Download Demo Version And Testify! 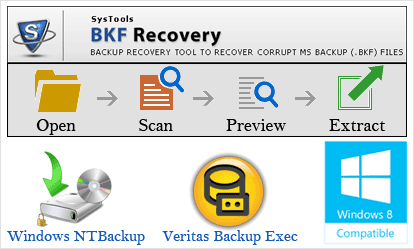 If you too are facing such corruption errors and are in urgent need to recover data files from damaged backup file due to permanent loss of original data files then you should opt for the easiest solution and perform Windows backup repair using our BKF Recovery software. For this you can download its demo version from the link provided and avail benefits of it.